After Pope and Allatoona finished the first two games of their best-of-three Georgia High School Association Class 6A championship series at 1:07 a.m. Wednesday morning, Pope figured they could finish a little earlier. At least an hour a half earlier. 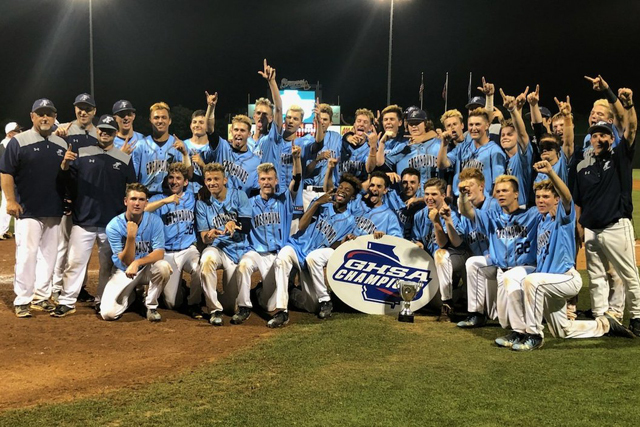 Pope, the defending Class 6A champions, broke open a close game with a seven-run seventh inning to win 10-2 and claim back-to-back state championships Wednesday night at Rome's State Mutual Stadium. It was Pope's fourth state title in a 10-year span. The Greyhounds won state titles in 2009, 2013 and 2017. In 2016, they finished as the state runner-up. The Greyhounds needed nine innings in Game 2 to win 8-4 early Wednesday morning after Allatoona took the opener 11-9. It was the first state championship series appearance for the Buccaneers who finished with a 34-8 record. Pope (34-8) has compiled an impressive 96-22 combined record over the past three seasons. The Greyhounds took an early 2-0 in the second inning on an RBI single from Grayson Caldwell and an RBI groundout from Connor Frost. They made it 3-0 in the top of the fourth on Frost's RBI single. But Allatoona scored a run each in the fourth and fifth innings to close the gap at 3-2. However, that was as close as the Bucs could get. Reid Robertson earned the victory on the mound for the Greyhounds. Antonio Jareno and James Tibbs collected two hits each to lead the Pope offense. Greg Boland and Blake Evans finished with two hits each for the Buccaneers.